The latest example of an internet viral sensation crossing into the offline (real) world is icanhascheezburger.com. Favourite images from the I Can Has Cheezburger site have been compiled into a 'Lolcat Colleckshun' and even though it went on sale today, it has already sold out on Amazon in the UK! The icanhascheezburger.com website was listed at number 8 of the Observer's top 50 most influential blogs and this summer icanhascheezburger.com was in the Alexa top 1000 visited websites in the world - not bad for a site built around pictures of cats with silly captions! The site was started in January 2007 after Eric Nakagawa found an amusing cat picture and emailed it to a friend. 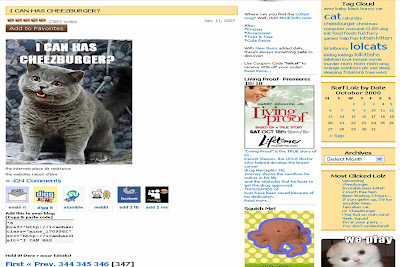 After posting this picture to the internet, the I Can Has Cheezburger site grew and grew, leading to a sale in September 2007 that valued icanhascheezburger.com at $2m. The I Can Has Cheezburger site receives over 10,000 captioned photos each day (though only a handful are published) and has its own 'Lolcat language.' Translation dictionaries are being worked on and there is even a project to produce a lolcat version of the bible at http://www.lolcatbible.com! Given the site traffic it is not surprising to see that the book is a bestseller, however the book may be just be the start - how long before we start seeing Lolcat TV or a Lolcat language setting on Facebook??? ?